← Libertarian Commentary on the News, 29 DEC 2015, #15-52A: Lies and More Lies – What can we believe? It seems that the NutCases are out in force again this week, with Jeremiads about the “abnormal” weather and blaming everything from HAARP to manmade global warming to God’s punishment on the Fifty States for Hillary and the Donald. Consider this rather stupid article on Prison Planet screaming about the “major disasters” in December: wildfires in LA and tornadoes in Texas. These are NOT THAT unusual, not when you look at weather and climate in terms of decades and even centuries, as you should. And these are NOT “major disasters” either: a 1230-acre (not even two square miles) wildfire in California is NOT “major” in any way as reported by Yahoo; and neither is 11 or even 43 dead in a series of early winter tornadoes (which DO happen every few decades.) as reported by CNN. I feel sorrow and sympathy for those who lost homes or family or both, but these are NOT some kind of end-time events. But people are fearful, and outfits like Prison Planet are in the business of scaring them more. Just as is the mainstream media. Another news story, from Last Resistance, reports that West Coast Ski areas are raking in the dough because of a record snowfall that MIGHT break the “exceptional” drought which has engulfed California, as shown in the map below from the 22nd (the new one is due out on the 31st), found at the University of Nebraska website. Closer to home, Hesperus Ski Area (a tiny little resort between Durango and Mancos, and a hundredth the size of Purgatory or Durango Mountain Resort has 46 inches of snow, which is more snow than it got ALL of the winter of 2014-15, and maybe more than the past several years all together. Purgatory itself has gotten 61 inches (and has 54 on the ground right now). This is NEAT, and WELCOME. 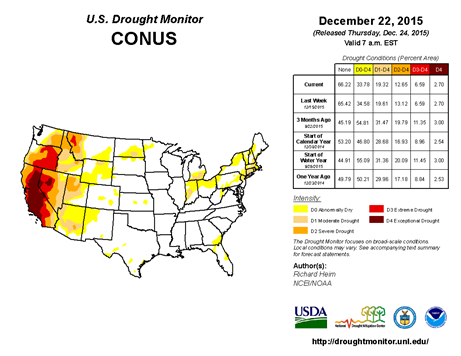 The drought in Southwestern Colorado and adjacent areas has been dealt a strong blow. These sorts of weather events are NOT “abnormal,” and are welcome to reduce or end drought and supply water to all the greedy folks downstream in SoCal, Las Vegas, and Arizona. And maybe even have some left over for us here locally! But that doesn’t sell ads and doesn’t get campaign contributions or donations or votes. Believing that these are “major disasters” just plays into the hands of politicians and government: more and more people scream for “more security” and are willing to give almost anything for that false hope. Or give UP almost anything… Barf. CNS News tells us about the latest in the EPA’s “Fight Food Waste” campaign. In the video posted on YouTube and in the text accompanying it, EPA claims that food waste contributes to climate change. We waste food, throw it away, it ends up in landfills and rots and produces methane which causes global warming, so the argument goes. Except that in most landfills in the West it just dries out, for these landfills produce very little methane. And that methane is often sucked out and used for fuel, just as more and more of the food waste is diverted to composting operations. And even then, that amount of methane generated by leftover (uneaten leftovers, let me add) Thanksgiving and Christmas meals (and as compared to the other 363 days a year) is pretty small potatoes (pun intended) when compared to the Aliso Canyon natural gas leak (most recently reported by UPI) which has supposedly released more than 150,000 tons of odorized methane and is “the worst environmental disaster since the BP spill” in the Gulf of Mexico.” Funny, huh? You haven’t heard the squatter at 1600 PA or any of his minions screaming about how we HAVE to do something, even though this is supposedly increasing California’s greenhouse gas emissions by 25% for the current year (the leak is about three months old now), and the leak probably can’t be stopped until Springtime, and thousands of homes have been evacuated (as compared to a mere 50 for the “major disaster” fire and those only for a couple of days). No priority? No national mobilization to stop it? No official pronouncements and condemnation of SoCal Gas for being a greedy and monstrous corporation? Yet supposedly, with wars all over the place and terrorist attacks around the world and everything else, the “war on climate change” is the primary concern both of the squatter-tyrant AND the UN Secretary General (as reported by CNS News also says that most of his effort for his entire time in office has been committed to dealing with global warming. Something’s wrong here, but I guess I’m just too stupid to understand. For once, they may be right! As reported in World Net Daily, a “new poll reveals that 45 percent of the Democrats who responded believe that Christians are a greater threat to America than Muslims. No shock that 72 percent of atheists agree. But the surprise is that 18 percent of those who consider themselves ” very conservative” agree. As do 29 percent of Protestants. And 23 percent of Catholics. Interestingly, the sample of Muslims was very small, but 100 percent said it is Muslims who are the greater danger.” If we are talking about the FedGov and the various state governments and local governments (and even tribal governments), these people may be right. The Bible does NOT support the system of government we have today, and does NOT support the imperial ambitions that have gradually swallowed much of what has been good about the Fifty States; indeed, the Bible opposes such and condemns it for the evil that it is. (Again, I have to explain that although I am a christian (lower-case intended), I am not Catholic nor Protestant. Neither of those groups follows the plain and simple teaching of Scripture, in my opinion.) People who are truly seeking to follow the Bible and serve God must, in the long run, reject 21st Century “America” as corrupt, evil, and opposed to God and the liberty which He gave us. They are not going to “overthrow” America or the FedGov, but as they convert more and more people and have more and more influence on the people, finally the government will collapse from lack of support. Or at a minimum change to something that will be very, very different from the horror we endure today. Mama’s Note: The only hope is for people to recognize that no “system” is ever going to work for everyone. Individuals must learn to leave each other alone to believe and live and associate (or not associate) as they choose, being ever vigilant and willing to defend themselves against aggressors, whatever those aggressors choose to call themselves. Is this why some of the “eyewitnesses” to the San Bernadino killings have claimed the shooters were three big “white guys”? Were they hoping? Expecting it? World Net Daily reports with disapproval that actor Samuel Jackson “really wanted the San Bernardino terrorists to be crazy white guys,” and not Muslims, although I think WND comes off too strong against Jackson, taking his words out of context. Logically, it makes no sense that even for a false flag attack the attackers (two or three; where IS that third guy that even the media saw?) would appear to be white. There is no shortage of amoral killers for hire who are dark-skinned and of a “proper” height to be a Middle-Eastern couple. But the right-wing (and too many who claim to be libertarian) are willing to grab at anything to denigrate their opponents. Jackson is no friend of liberty, but he does not deserve unfair condemnation. This entry was posted in Commentary on the News and tagged California, global warming, living faith, Los Angeles, major disasters, New religions: global warming, Politics 2015, Politics 2016, San Bernardino, Texas, threats to America, Tranzis, Weather. Bookmark the permalink.